Hydrogenases catalyze the simplest of all chemical reactions: the reduction of protons to molecular hydrogen or vice versa. Cyanobacteria can express an uptake, a bidirectional or both NiFe-hydrogenases. Maturation of those depends on accessory proteins encoded by hyp-genes. The last maturation step involves the cleavage of a ca. 30 amino acid long peptide from the large subunit by a C-terminal endopeptidase. Until know, nothing is known about the maturation of cyanobacterial NiFe-hydrogenases. The availability of three complete cyanobacterial genome sequences from strains with either only the uptake (Nostoc punctiforme ATCC 29133/PCC 73102), only the bidirectional (Synechocystis PCC 6803) or both NiFe-hydrogenases (Anabaena PCC 7120) prompted us to mine these genomes for hydrogenase maturation related genes. In this communication we focus on the presence and the expression of the NiFe-hydrogenases and the corresponding C-terminal endopeptidases, in the three strains mentioned above. We identified genes encoding putative cyanobacterial hydrogenase specific C-terminal endopeptidases in all analyzed cyanobacterial genomes. The genes are not part of any known hydrogenase related gene cluster. The derived amino acid sequences show only low similarity (28–41%) to the well-analyzed hydrogenase specific C-terminal endopeptidase HybD from Escherichia coli, the crystal structure of which is known. However, computational secondary and tertiary structure modeling revealed the presence of conserved structural patterns around the highly conserved active site. Gene expression analysis shows that the endopeptidase encoding genes are expressed under both nitrogen-fixing and non-nitrogen-fixing conditions. 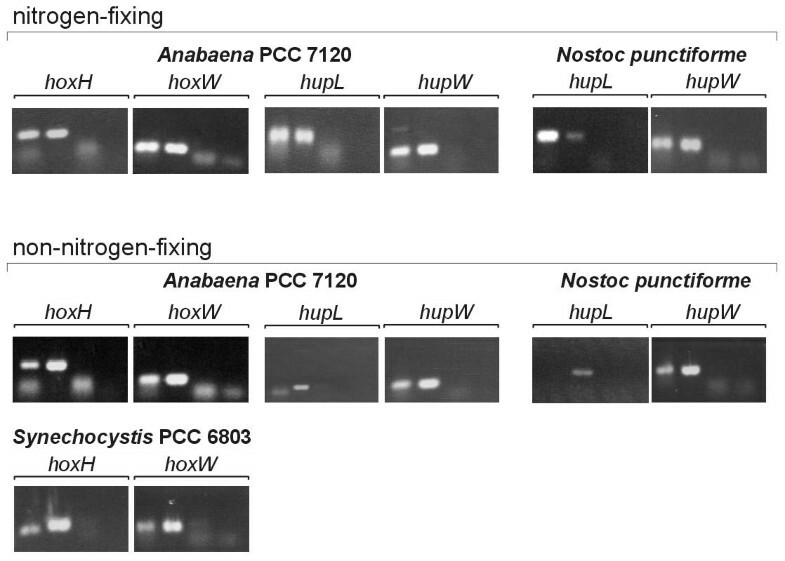 Anabaena PCC 7120 possesses two NiFe-hydrogenases and two hydrogenase specific C-terminal endopeptidases but only one set of hyp-genes. Thus, in contrast to the Hyp-proteins, the C-terminal endopeptidases are the only known hydrogenase maturation factors that are specific. Therefore, in accordance with previous nomenclature, we propose the gene names hoxW and hupW for the bidirectional and uptake hydrogenase processing endopeptidases, respectively. Due to their constitutive expression we expect that, at least in cyanobacteria, the endopeptidases take over multiple functions. Hydrogenases catalyze the simplest of all chemical reactions: the reduction of protons to molecular hydrogen or vice versa. Depending on the metal content of the active site hydrogenases are classified into Fe-, NiFe-, and metal-free hydrogenases . Independent from the metal content, the enzymes are characterized as hydrogen uptake, bidirectional and hydrogen evolving hydrogenases, indicating their actual in vivo activity. A prominent and evolutionary old group of organisms possessing NiFe-hydrogenases are phototrophic cyanobacteria (formerly blue-green algae) . All cyanobacteria investigated so far, express an uptake, a bidirectional or both NiFe-hydrogenases [2–6]. The uptake hydrogenase is a dimeric enzyme consisting of a large subunit (HupL) containing the active site and a small subunit (HupS) with several FeS-clusters. The physiological role of the uptake hydrogenase appears to be coupled to nitrogen fixation [7–9]: the hydrogen evolved as a by-product from nitrogenase activity can be recycled by the action of the uptake hydrogenase . Consequently, the uptake hydrogenase is found in nitrogen-fixing cyanobacteria only [2, 10]. The bidirectional hydrogenase consists of an electron transmitting and anchoring diaphorase part (HoxFU), an active site containing large subunit (HoxH) and a FeS-cluster harboring small subunit (HoxY) [3, 11]. The presence of a third diaphorase subunit (HoxE) has been demonstrated for Anacystis nidulans (Synechococcus PCC 6301) and Synechocystis PCC 6803 . Neither is the bidirectional hydrogenase universally distributed among cyanobacteria nor is its function clearly understood, yet . The maturation of nickel-containing enzymes, e.g. hydrogenases, ureases, and carbonmonoxide dehydrogenases, is a complex process requiring accessory proteins [13–19]. For hydrogenases, the first experimental results were obtained from Escherichia coli. A number of mutations in the 58–59 min region of the E. coli chromosome (location 2848670–2852287 in E. coli strain K12 genome ) affect the biosynthesis of all NiFe-hydrogenases of this organism . 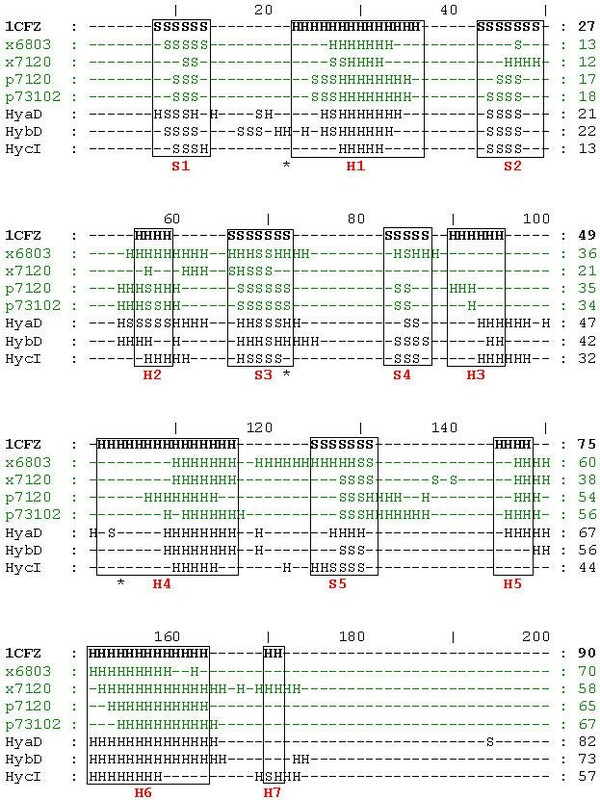 Sequencing of this region revealed 5 ORFs, which were designated hypABCDE, indicating that these genes affect hy drogenases p leiotropically  and which were to be the first identified genes associated with hydrogenase maturation. Later on, hyp homologous genes were also identified in cyanobacteria (see  and references therein). One distinct step in NiFe-hydrogenases maturation is the endoproteolytic cleavage of a C-terminal peptide (ca. 30 amino acids) of the large subunit precursor . E. coli is able to synthesize at least three NiFe-hydrogenases (operons hya, hyb and hyc, encoding hydrogenase 1, 2 and 3, respectively). In addition, the operon for a fourth hydrogenases (operon hyf, encoding hydrogenase 4) has been identified but its functional expression has not been proven yet . Hydrogenases 1 and 2 have been shown to be involved in anaerobic hydrogen oxidation for energy production [24–27], whereas hydrogenase 3 is part of the formate-hydrogen-lyase complex and catalyzes the evolution of hydrogen from formate . Each hydrogenase isoenzyme large subunit is proteolytically processed by a corresponding specific C-terminal endopeptidase (i.e. HyaB by HyaD, HybC by HybD and HycE by HycI). There has been no peptidase identified for HyfG yet. The peptidases cleave the hydrogenase large subunit precursor proteins after a histidine or arginine residue in the C-terminal consensus motif DPCxxCxx(H/R) liberating a short polypeptide (Table 1) [29–32]. The first crystal structure from a NiFe-hydrogenase of the sulfate reducing bacterium Desulfovibrio gigas  revealed that those conserved cysteines are ligands to the NiFe-active site of hydrogenases. The endopeptidase HybD, responsible for proteolytic maturation of the precursor of the large subunit from hydrogenase 2 of E. coli, has been overexpressed and crystallized . X-ray analysis of the crystal structure revealed the presence of three amino acid residues, which are involved in metal binding (Glu16, Asp62, and His93). Recognition of the hydrogenase by the peptidase does not depend on the cleavage site consensus sequence but is mediated by the overall 3-dimensional hydrogenase and peptidase protein structures [35, 36]. Until now, nothing is known about the maturation of cyanobacterial NiFe-hydrogenases. Previously, we cloned, sequenced and characterized a hyp-operon from the heterocystous nitrogen-fixing cyanobacterium Nostoc punctiforme ATCC 29133/PCC 73102 . 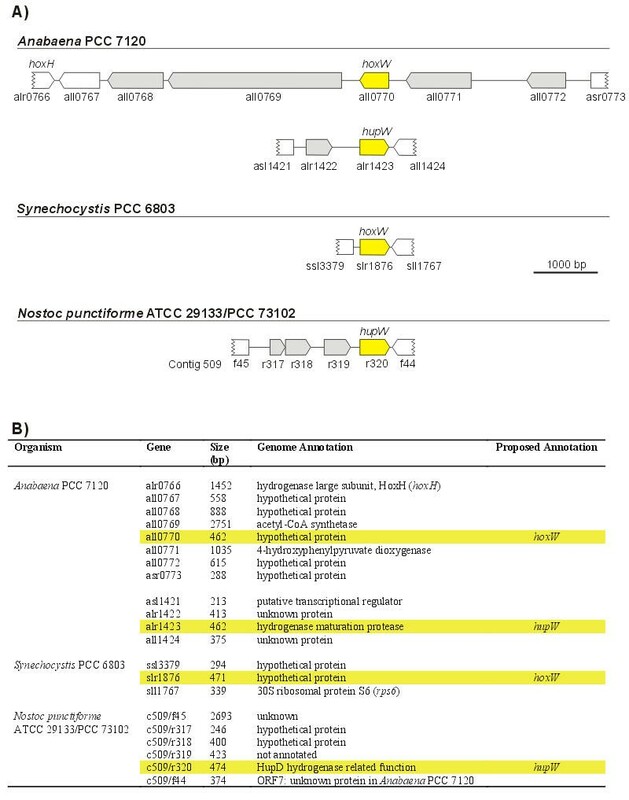 The availability of three completed cyanobacterial genomes from organisms with either only the uptake (Nostoc punctiforme ATCC 29133/PCC 73102 ), only the bidirectional (Synechocystis PCC 6803 [39, 40]) or both NiFe-hydrogenases (Anabaena PCC 7120 ) prompted us to mine these genomes for hydrogenase-related genes. In this communication we focus on the presence and the expression of the NiFe-hydrogenases and the corresponding putative hydrogenase specific C-terminal endopeptidases in these three strains. The C-terminal part of deduced cyanobacterial hydrogenase large subunit amino acid sequences. Cyanobacterial sequences in the focus of this study are shown in bold. The accession number and the C-terminal protein sequence follow the gene name. The putative cutting site is represented by a gap. As reference, the cutting sites of Escherichia coli hydrogenase large subunits are shown. Corresponding GenBank accession numbers are indicated. The consensus sequence D(P/S)CxxCxx(H/R) is shown in italic letters. Initially, we investigated the C-terminal parts of all available cyanobacterial hydrogenase large subunit sequences for the presence of the characteristic cutting site motif: DPCxxCxx(H/R) [1, 19]. This motif was found in all deduced amino acid sequences (Table 1). In contrary to all other analyzed sequences, in the uptake hydrogenase (HupL) cutting site motif the neutral proline (P) at position 2 is exchanged by an uncharged polar serine (S) (Table 1). In order to search for putative hydrogenase specific C-terminal endopeptidases (hydrogenase maturating peptidases) in the cyanobacterial genomes, the protein sequences of HyaD, HybD, and HycI from E. coli were used in BLAST searches. The E. coli sequences are 22 to 41% similar to each other (Table 2). Analysis of the positive hits revealed overall low similarities between both the E. coli and the putative cyanobacterial hydrogenase maturating peptidases, and among the cyanobacterial proteins, respectively (Table 2). The average similarity is 42%. Interestingly, only in the Anabaena PCC 7120 genome two putative cyanobacterial hydrogenase maturating peptidases were found. The deduced amino acid sequences show 27 and 89% similarity to the putative cyanobacterial hydrogenase maturating peptidase from the closely related Nostoc punctiforme ATCC 29133/PCC 73102. In addition to the putative peptidase genes, sequences of flanking genes with the same reading frame orientation were retrieved (Fig. 1AB). Analysis of these genes gave no indication of functional relations (Fig. 1B). None of the open reading frames oriented in the same direction showed any homology to any known protein involved in either hydrogenase maturation or hydrogen metabolism. This finding is not surprising in the case of Synechocystis PCC 6803. In this strain all hydrogenase maturation related genes were found to be scattered over the entire genome . However, in the case of Anabaena PCC 7120  and Nostoc punctiforme ATCC 29133/PCC 73102  the hyp-genes were found to be clustered in one operon. Cyanobacterial hydrogenase specific endopeptidases. A) The hydrogenase specific endopeptidase genes (colored in yellow) and flanking regions are shown. The size of the flanking region was chosen so that all open reading frames having the same direction are included (putative operons; colored in gray). B) Annotation of the above genes according to genome database entries. In addition, the proposed annotation of the cyanobacterial hydrogenase maturating endopeptidases is shown. Protein cross-comparison Deduced amino acid sequence relationship among the putative cyanobacterial and known Escherichia coli hydrogenase specific C-terminal endopeptidases. Similarities are shown in bold. 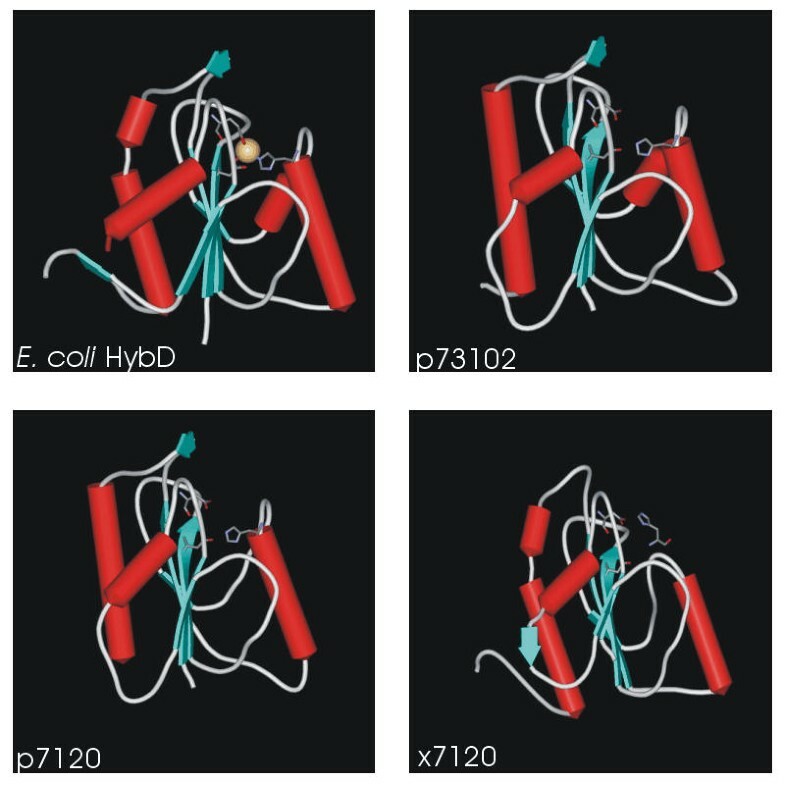 Figure 2 shows an alignment of the retrieved putative cyanobacterial hydrogenase maturating peptidases and the known enzymes from E. coli. In all sequences the nickel-binding site, as assigned from the E. coli HybD crystal structure , could be identified at conserved positions. It consists of an N-terminal aspartic or glutamic acid residue, a second aspartic acid residue and a histidine residue (Fig. 2). The amino acid conservation around these active site metal-binding amino acids was found to be low. Thus, the identity of the cyanobacterial hydrogenase maturating peptidases can not be unambiguously concluded from the primary sequence information alone. In order to corroborate the identity and to collect further evidence for the participation of the three highly conserved amino acids in metal binding, secondary and tertiary protein structures were computed. Figure 3 shows an alignment of alpha helices and beta sheets, which were calculated by the program NNPREDICT . The alignment clearly shows that the putative cyanobacterial hydrogenase maturating peptidases are structurally related to the hydrogenase maturating peptidases from E. coli (67–77% structural identity). Primary structure alignments. Deduced amino acid sequence alignment of the putative cyanobacterial (green letters) and the E. coli (black letters) hydrogenase maturating endopeptidases. 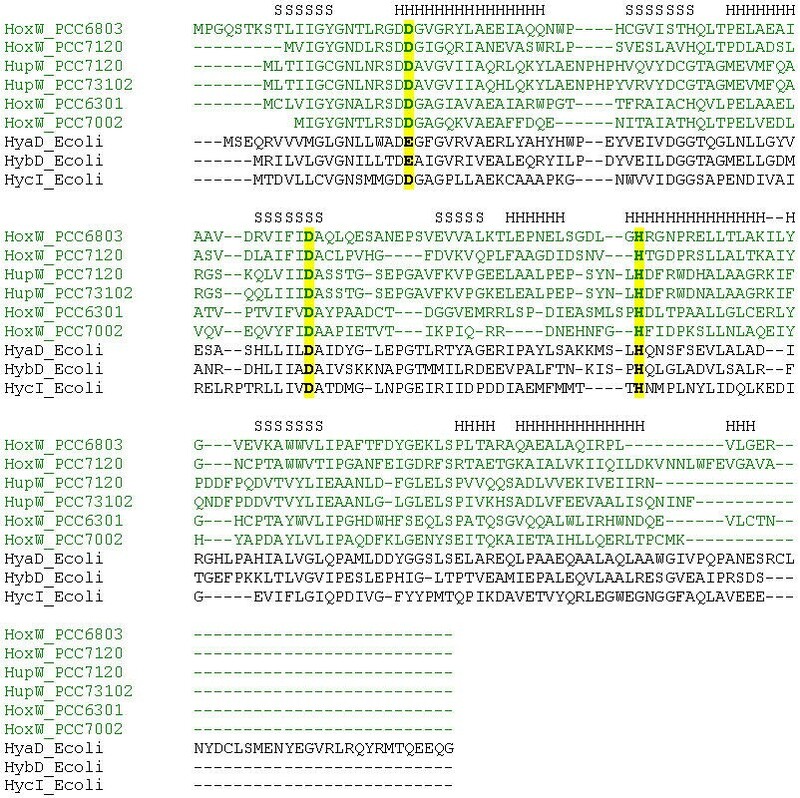 The top row indicates secondary structure features (H: alpha helix, S: beta sheet), which were extracted from the crystal structure of E. coli HydD  using the software tool DSSP . The conserved nickel coordinating amino acid residues are shaded yellow. The sequences are annotated with the (suggested) protein name plus the organism identification: PCC6803: Synechocystis PCC 6803, PCC7120: Anabaena PCC 7120, PCC73102: Nostoc punctiforme ATCC 29133/PCC 73102, PCC6301: Synechococcus PCC 6301, PCC7002: Synechococcus PCC 7002, Ecoli: Escherichia coli. Secondary structure alignments. Alignment of the secondary structures of cyanobacterial (green letters) and known E. coli (black letters) hydrogenase maturating endopeptidases. The secondary structures, except for the top sequence 1CFZ (bold letters), were determined from the deduced amino acid sequences using NNPREDICT . 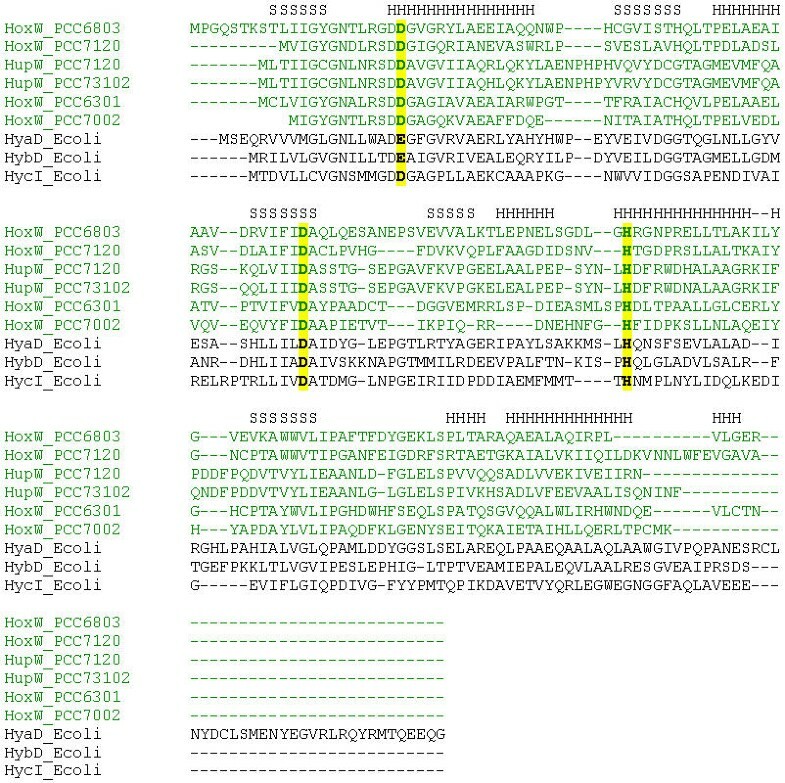 The secondary structure features from the crystal structure of E. coli HydD (1CFZ)  were extracted using DSSP and used as reference (top sequence). Boxes are drawn and named according to the nomenclature used by Fritsche et al. . The stars mark the position of nickel ligating amino acid residues. The right column indicates amino acid counting. H: alpha helix, S: beta sheet, x6803: HoxW from Synechocystis PCC 6803, x7120: HoxW from Anabaena PCC 7120, p7120: HupW from Anabaena PCC 7120, p73102: HupW from Nostoc punctiforme ATCC 29133/PCC 73102, HyaD, HybD, and HycI: sequences from Escherichia coli. – Note that the same amino acid sequence underlies 1CFZ and HybD. Thus, their secondary structure comparison reflects the accuracy of NNPREDICT. This allowed performing a 3-dimensional alignment against HybD from E. coli. Except for the sequence from Synechocystis PCC 6803 all putative cyanobacterial hydrogenase maturating peptidases could be aligned with and fitted to the 3-dimensional structure of HybD (Fig. 4). From Table 2 it can be seen that of all analyzed putative cyanobacterial hydrogenase maturating peptidase sequences the Synechocystis PCC 6803 sequence shows the lowest similarity (28%) and identity (14%) to HybD from E. coli. Most probably, this accounts for the computational inability to perform a 3-dimensional alignment to E. coli HybD. For the putative cyanobacterial hydrogenase maturating peptidases from Nostoc punctiforme ATCC 29133/PCC 73102 and Anbaena PCC 7120 the 3-dimensional structural alignment result in an almost perfect match (Fig. 4). Most importantly, the active site metal-binding amino acid residues fit into the same sterical conformation as in the HybD template. Taken all data of the sequence analysis together, the sequences all0770 and alr1423 from Anabaena PCC 7120 and the sequence c509/r320 from Nostoc punctiforme ATCC 29133/PCC 73102 can clearly be assigned as hydrogenase maturating peptidases. The good secondary structure alignment between sequence slr1876 from Synechocystis PCC 6803 and HybD from E. coli, especially with respect to the active site metal-binding amino acid residues, identifies this gene as encoding a hydrogenase maturating peptidase, too. In the future, we hope to obtain physiological and biochemical evidence to corroborate these identifications. It should be noted that, according to the structural classification of proteins (SCOP; ), HybD (1CFZ) belongs to the superfamily of HybD-like structures in the class of alpha/beta proteins. The only other known structural member of this superfamily is a germination protease from Bacillus megaterium (1C8B, ), which contains a phosphorylase/hydrolase-like fold. Although sequence-wise very different, germination proteases match structurally very good to hydrogenase maturating peptidases. The only exception is the absence of helices 4 and 5 in the former enzymes (Fig. 3). From previous studies, the expression of hydrogenase structural genes is well known (see  for a review). The bidirectional hydrogenase is continuously expressed, though strongly induced by e.g. anaerobic conditions, as shown for Nostoc muscorum . The uptake hydrogenase is only expressed under nitrogen-fixing conditions in Anabaena PCC 7120 and Nostoc punctiforme ATCC 29133/PCC 73102. In order to analyze the expression pattern of the cyanobacterial hydrogenase maturating peptidase genes and the hydrogenase large subunit structural genes, we performed RT-PCR based transcription studies (Fig. 5, Table 3). A transcript corresponding to the hydrogenase maturating peptidases could be detected under all conditions examined. This means that the transcript is present when the corresponding hydrogenase large subunit transcript is absent. Thus, the expression of the putative hydrogenase maturating peptidases seems to be differently regulated than the expression of both the hydrogenase structural and accessory genes in cyanobacteria. For Anabaena PCC 7120 it was shown that the accessory genes hypFCDEAB (initially identified as hup-genes) are expressed in heterocyst-induced (nitrogen-fixing) but not in non-nitrogen-fixing cultures [2, 42]. The same situation was described for Nostoc punctiforme ATCC 29133/PCC 73102 . These findings point to either a post-transcriptional regulation of the peptidase transcript or to an additional function of the protein. Since proteolytic processing of the large hydrogenase subunit is considered to be the last step during hydrogenase maturation, the former mechanism would allow a rapid maturation of the pre-processed, but immature, hydrogenase . Our observation is supported by the finding that in the unicellular cyanobacterium Synechococcus PCC 7942 (Anacystis nidulans R2) hoxW is co-transcribed as part of the polycistronic message hoxUYHW [47, 48]. Thus, similar expression levels were anticipated for these genes. However, hoxU and hoxW transcription was found to be ca. 4-times higher than hoxY and hoxH transcription . Furthermore, hoxW was found to have its own promoter element. Thus, although part of a polycistronic transcript with structural hydrogenase genes, transcription of hoxW can be independently regulated in Synechococcus PCC 7942. In the cyanobacteria analyzed in the present study, the independence of hoxW and hupW is pronounced by their operon distribution in the respective genomes (Fig. 1) and is further reflected in their transcription being independent of the structural hydrogenase genes (Fig. 5, Table 3). Gene expression analysis RT-PCR results are shown for nitrogen-fixing and non-nitrogen-fixing conditions. The PCR generated DNA products were visualized by agarose gel electrophoresis. From the left to the right the four individual lanes on each agarose gel represent: 1) RT-PCR product demonstrating the transcription of the hydrogenase maturating peptidases (hoxW/hupW) and their respective hydrogenase large subunits (hoxH/hupL). 2) Control, where DNA instead of the cDNA sample from the RT reaction from the respective strain were used in the PCR reaction. 3) Control, with no reverse transcriptase enzyme added to the RT reaction. 4) Control, where dH2O instead of the cDNA sample from the RT reaction was added to the PCR reaction tube. Product sizes are shown in Table 4. Diffuse bands originate from primer-dimers artifacts. Nostoc punctiforme: Nostoc punctiforme ATCC 29133/PCC 73102. Summary of the gene expression studies Note that Synechocystis PCC 6803 does not survive under nitrogen deprivation, i.e. nitrogen-fixing conditions. Hydrogenase specific C-terminal endopeptidases share only low sequence similarity. Thus, the present study gives an example for the necessity to apply secondary and tertiary protein sequence information in order to facilitate unambiguous gene identification. Anabaena PCC 7120 possesses two NiFe-hydrogenases and two hydrogenase specific C-terminal endopeptidases but only one set of hyp-genes. Thus, in contrast to the universal Hyp-proteins, the C-terminal endopeptidases are the only known hydrogenase maturation factors that are specific. In order to keep in line with previous nomenclature we name the bidirectional hydrogenase (encoded by hox-genes) processing endopeptidases HoxW and propose to name the hydrogenase uptake (encoded by hup-genes) processing endopeptidases HupW. Phylogenetic analysis of NiFe-hydrogenases revealed a close relationship between cyanobacterial uptake hydrogenases (HupSL) and bacterial hydrogen sensing hydrogenases (HoxBC, HupUV) . These hydrogen sensors lack the C-terminal extension, which is cleaved off after nickel insertion, but nevertheless contain the bimetallic NiFe-center [49–51]. This indicates that the final endopeptidase mediated hydrogenase maturation step is not absolutely necessary in order to obtain the fully assembled active site. From a phylogenetic point of view it seems that the last common ancestor of cyanobacterial uptake hydrogenases and hydrogen sensing hydrogenases possessed the C-terminal extension and the cutting site motive. Thus, it will be interesting to elucidate the advantage or necessity to loose that extension in the case of hydrogen sensing hydrogenases. Furthermore, it raises the question why the C-terminal extension was kept in all other known NiFe-hydrogenase. The fact, that cyanobacterial hydrogenase specific endopeptidase are constitutively expressed might point to multiple functions of these enzymes. The genomes of Nostoc punctiforme ATCC 29133/PCC 73102 http://spider.jgi-psf.org/JGI_microbial/html/nostoc/nostoc_homepage.html, Anabaena PCC 7120 http://www.kazusa.or.jp/cyanobase/Anabaena/index.html and Synechocystis PCC 6803 http://www.kazusa.or.jp/cyanobase/Synechocystis/index.html were analyzed using the online program BLAST (Basic Local Alignment Search Tool)  provided by the respective genome initiative. For Nostoc punctiforme ATCC 29133/PCC 73102, preliminary sequence data was obtained from "The DOE Joint Genome Institute (JGI)". The derived protein sequences from the putative cyanobacterial hydrogenase maturation peptidase genes were structurally aligned using the online program SWISS MODEL http://www.expasy.ch/swissmod/SWISS-MODEL.html[53–55]. As reference the crystal structure from the hydrogenase specific C-terminal endopeptidase HybD from E. coli  was chosen. The secondary structure was predicted using NNPREDICT http://www.cmpharm.ucsf.edu/~nomi/nnpredict.html. No special parameters were set. The secondary structure from the crystal structure data file of the hydrogenase maturating endopeptidase HybD from E. coli  (ProteinDataBank accession number: 1CFZ.pdb) was extracted by DSSP http://www.cmbi.kun.nl/swift/dssp/. These data were used as a template for secondary structure identity calculations. The calculations were performed with a homemade PERL script employing a weight matrix. Identities were weighted one, all other combinations zero. Using the genomic sequences as templates PCR and reverse transcription PCR (RT-PCR) oligo-nucleotide primers were designed using the online program Primer3 (S. Rozen and H. J. Skaletsky, 1996,1997,1998; code available at http://www-genome.wi.mit.edu/genome_software/other/primer3.html). The expected product size was set to be around 300 bp. All used primers are shown in Table 4. Primers used in PCR and RT-PCR experiments performed in this study Primer sequences are shown 5' to 3'. "L" annotates sense, "R" antisense primers. In addition, the proposed gene names, as depicted in Fig. 1, and PCR product sizes are shown (see also Fig. 5). Nitrogen-fixing cultures of Nostoc punctiforme ATCC 29133/PCC 73102 and Anabaena PCC 7120 were grown in BG110  as previously described . Non-nitrogen-fixing cultures of Nostoc punctiforme ATCC 29133/PCC 73102, Anabaena PCC 7120 and Synechocystis PCC 6803 were grown in BG110 supplemented with 5 mM ammonium chloride and 10 mM HEPES (pH 7.5) (Nostoc and Anabaena) or BG110 supplemented with 1.5 g/l (17.7 mM) sodium nitrate (Synechocystis). All cultures were sparked with air. Cells were harvested by centrifugation at 4°C for 5 min in 50 ml Falcon tubes (Falcon#2070). Subsequently, the supernatant was removed, the cell pellet immediately frozen in liquid nitrogen, and the cells stored at -20°C. Genomic DNA from all investigated cyanobacterial strains was isolated as described earlier . Total RNA was isolated from all strains as described by Axelsson et al. . Nucleic acid quality was assessed by gel electrophoresis (1% agarose) and photospectroscopy. Transcription analysis was carried out as previously described . Total RNA (0.5–1 μg) was used for reverse transcription with AMV reverse transcriptase (Promega Corporation) using antisense primers (Table 4). cDNA produced in reverse transcription reaction was used for PCR reactions with sense/antisense primer pairs given in Table 4. The following PCR program profile was applied: 1 min at 94°C followed by 40 repetitive cycles of 10 s denaturation at 94°C, 1 min annealing at 55.1°C, and 30 s elongation at 72°C and finishing with 7 min at 72°C. Products of the PCR reactions were analyzed using 1% agarose gels. Images were captured on film, scanned and edited into Photoshop 4.0. Negative controls included no reverse transcriptase in the RT reaction prior to PCR and dH2O in the PCR, both resulting in no amplificates. For positive controls genomic DNA was used in PCR. The authors research was financially supported by Ångpanneföreningens Forskningsstiftelse (Sweden), the Swedish Energy Agency (Statens Energimyndighet), and the Swedish Research Council (NFR/VR). Preliminary sequence data was obtained from "The DOE Joint Genome Institute (JGI)". RW carried out the computational studies, participated in the gene expression analysis and drafted the manuscript. MB carried out the RT-PCR reactions. Both RW and PL conceived of the study, and participated in its design and coordination. All authors read and approved the final manuscript.